Although our EBIO 319 class was clearly dividing into teams Surf and Turf, based on whether we had signed up predominately to go to the reef or to the rainforest, everyone was able to thoroughly enjoy themselves in both environments because there are quite a few similarities between them. The most obvious similarity is that both are hotspots for biodiversity. Both coral reefs and rainforests are (predominately) restricted to the Tropics, and both are highly dependent on water. Additionally, nutrient input and cycling is critical to the stability and growth of both environments. Corals thrive in oligotrophic environments, and so they are dependent on nutrient-cycling symbionts. Tropical rainforests exist in nutrient-poor soils, and so the plant species are dependent on nutrient cycling. Another similarity that I noticed is that it is quite difficult to traverse through either of these environments. When snorkeling on the reef, there would sometimes be spots with very little accommodation space and it was difficult to pass through without bumping into the corals. In the rainforest, when we left the trail the vegetation was often very dense. There would be lots of vines hanging down between the trees, and a lot of holes in the ground. Additionally, you had to be careful moving through both of these environments because there were so many things that could hurt you. On the coral reef, this included anemones, fire coral, some hard corals, sharp shells, and jellies. 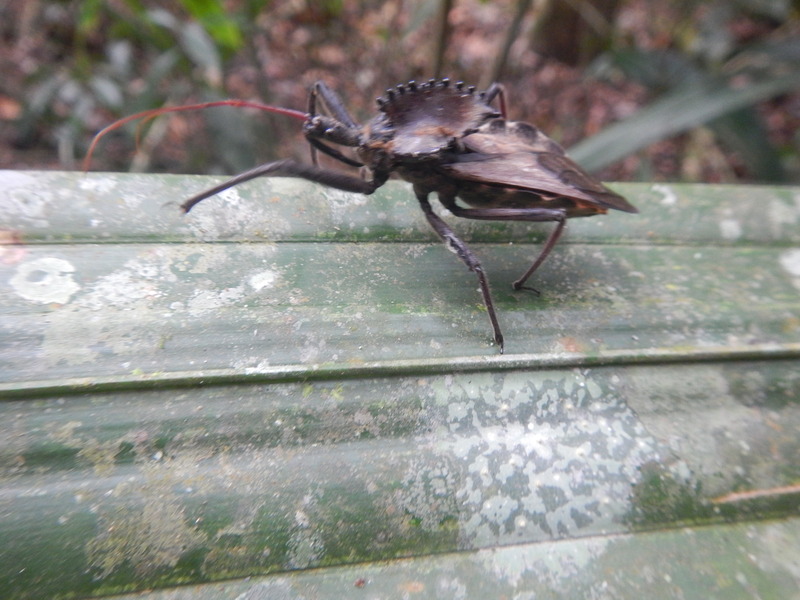 In the rain forest, this included venomous snakes, acacia thorns, fire ants, and ticks. I had a really good time during this course. The amount of work that it involved was much more than I expected, but during the course I didn’t worry about it too much. Going into the course, I didn’t really know what to expect about my classmates, but everybody was really cool and we got along really well. The rainforest’s appearance was not really what I expected but I think the reef did look like what I was expecting, probably just because I was more familiar with reefs going in. I was expecting Glover’s Atoll to be paradise, and it truly was. My favorite part of the course was being able to see cool species up close. There were so many, but highlights included the green turtle, the seahorse, the Queen Angelfish, the tapir, and the scarlet macaws. Another one of my favorite things that we did was going into the caves. These sightings and experiences are things that I will never forget. I think my least favorite part of the course was the fact that it was so windy during our time at Glover’s because as a result we never did get to go diving on the forereef or at night. My other least favorite part was probably the lionfish dissection because I just don’t like dissecting things in general. 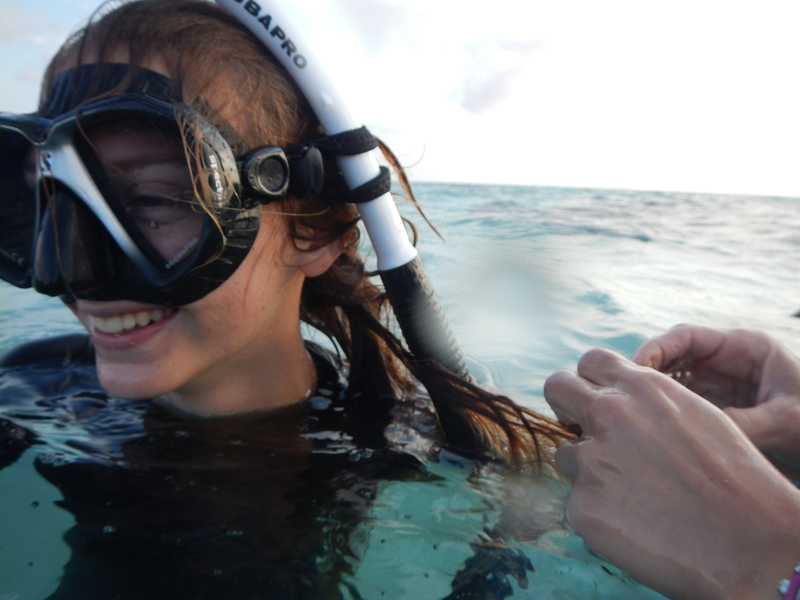 One of the most important things I learned on this trip was that I definitely still want to try and go into marine biology and do real field work. Another thing I learned was that friendships form really quickly when a group of people are all working together on something they’re passionate about. Lastly, I learned that conservation work is really really complicated after hearing presentations from Alex of the Wildlife Conservation Society and Boris of Friends of Conservation. This stuck with me because I’m doing a policy internship this summer at a marine sanctuary, and as a result I’ve gotten a small glimpse of all that conservation actually involves in this particular environment. 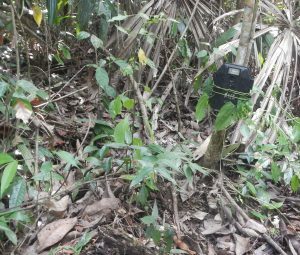 We decided to use the camera traps to test whether there was differences in the abundances of big cats and of big cats’ prey on the trails versus in the forest. We did this by placing three traps on the 50 Hectare Trail and four on the Monkey Tail Trail. 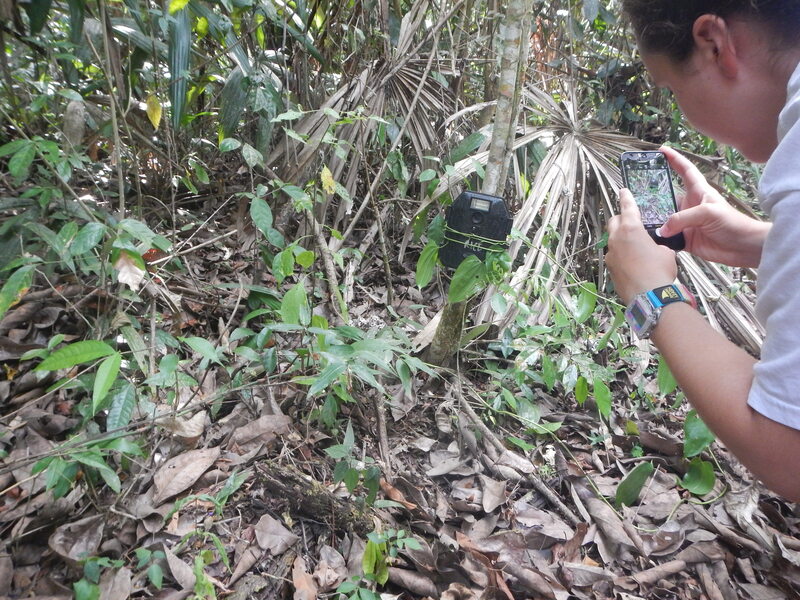 Also, for each camera we placed on the trail, we placed another one 300ft into the forest for a total of fourteen camera traps. Scott Solomon did not tell us until we set the last trap that no group had ever used that many before. One of the fourteen (!!) camera traps we set. As we were finding our way out of the forest after setting the very last trap we got a little bit turned around, and dusk was just starting to fall. A large portion of the trek back to Las Cuevas was really dark. We saw a small tommygoff snake in the dark, which was a little spooky because I would have not noticed it had Damien not pointed it out, and it is the most dangerous snake in Belize. Other things we saw on the hike were a Mexican Porcupine, Scorpion Eater Snake, Blue Morpho Butterflies, a mantis molt, a wheel bug, and a mammal skeleton. We also saw some cat scratch marks near where we set the traps, which seemed like a good sign. 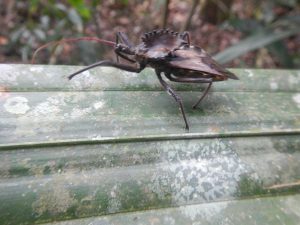 A cool Wheel Bug we saw this morning. I saw a few Orthoptera species today. One was the same Leaf Mimic Katydid that I’d already seen. The other hopped away too fast for me to identify it. We are all tired and ridden with ticks from walking through the forest, so these traps best capture some really cool pictures. I want to see a tapir the most. Out of the cats, I’d like to see an ocelot the most, probably. Today was the last day of EBIO 319, and tomorrow I will be back in my own bed. That’s pretty wild because it does not feel like two weeks have passed. 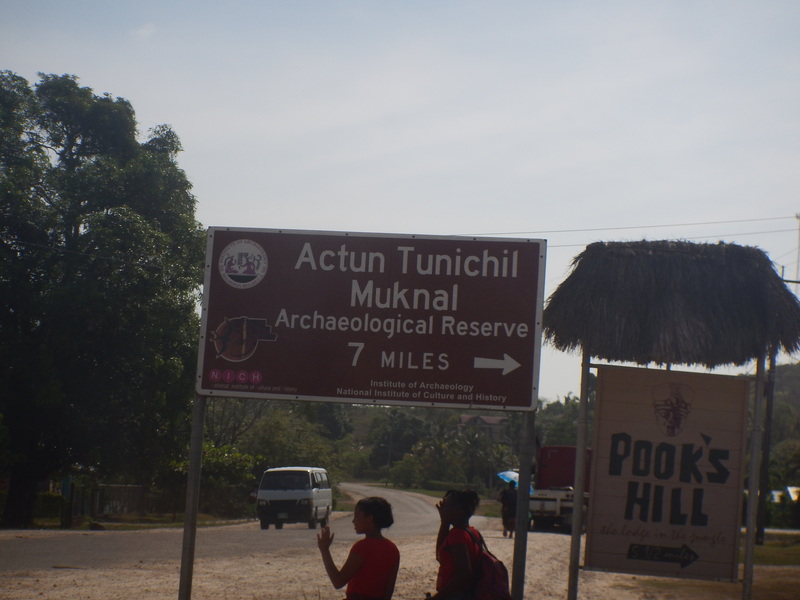 We left Las Cuevas around 8 this morning to head towards the Belize City Airport. Since we left early, I had time to bird watch, but I didn’t get a chance to see other forms of wildlife or any orthoptera. We stopped at a souvenir shop on the way, but I didn’t end up buying anything. We also stopped at Cheers Restaurant before we got to the airport. The food there was really cheap and our spending limit was really high, so I ended up getting a jumbo sized watermelon juice because I was way below the limit. I’m pretty sure they juiced an entire watermelon to make it. It was quite delicious. After we got to the airport and went through security, I got called up to the gate to be randomly screened. I got all patted down and had my things nosed through, but it was okay because I got to board the plane before everybody else. The same thing happened to Ellie too, so we were able to save four rows so that we could all sit together. My first interactions with Americans (besides those in EBIO 319) were very unpleasant as a result of this. First the flight attendant asked if Ellie or I wanted to date her son. Then lots of grumpy people glared at us and muttered things under their breaths as the plane got more crowded because the rest of the class was all in the very last boarding group and they didn’t like that we were saving so many seats. 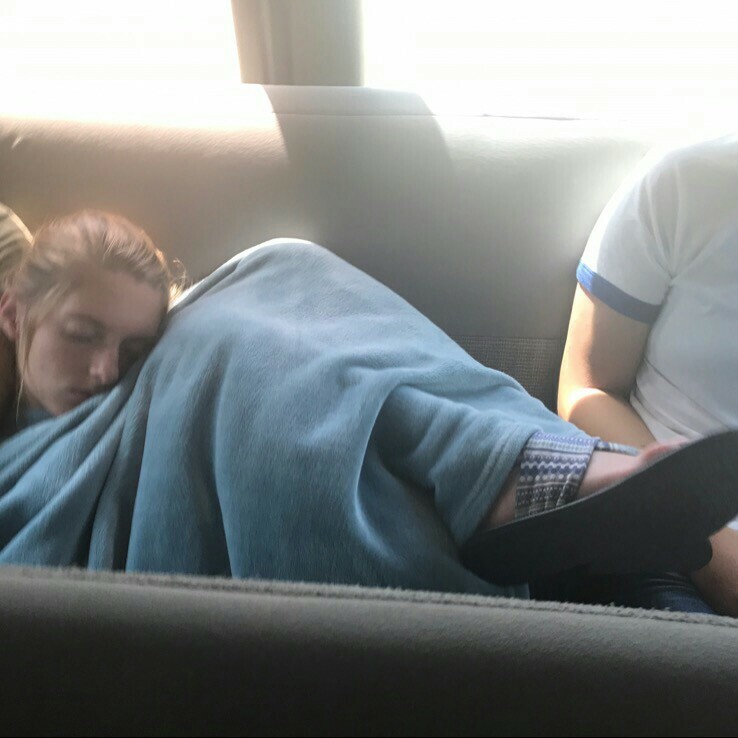 I was asleep for most of the van and plane rides. This was good because we all stayed up late last night and then got up at 5 this morning to bird watch, so I definitely needed the rest. But, this was bad because I apparently sleep with my eyes open and in oddly contorted positions, so now lots of pictures of this exist. In the van on the way to lunch. I am very exhausted, and it’s time for me to go to bed. Tomorrow morning, I’ve got to go back to the airport, and then I’ll be finally home. Today, we repeated the long hike we did a few days ago to go and retrieve our camera traps. Since we were all tired after setting them up, we unanimously wanted to walk much more efficiently and get an earlier start this time. Overall, I think everyone felt in much better spirits this hike. During the hike, I saw four Western Horse Lubber Grasshoppers, which was exciting because that was the Orthoptera species I had wanted to see the most. They were all nymphs, so they lacked their distinctive yellow mesh-like wings. They were still pretty cool though. I also saw a large cluster of really large Orthoptera nymphs which looked like they might have just hatched because there were so many congregated together. A Western Horse Lubber Grasshopper nymph. Fully grown, it will have cool yellow, mesh-like wings. Reviewing the camera trap pictures was super exciting. We got two pictures of ocelots, one of a Red Brocket Deer, one of a Great Curassow, one of a group of peccaries, and a couple of pacas. 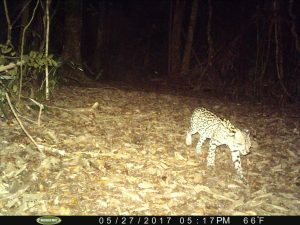 I wanted to see a tapir the most, but an ocelot had been a close second, so it was exciting to get two pictures of them. One turned out really clear. The ocelot captured on one of our camera traps set along the 50 Hectare trail. Tomorrow we are leaving to go back to Houston, and the day after that I’ll be back home. It feels like this whole trip went by fast, but I felt like the rainforest section went by especially quick. It’s sad that we’re leaving Belize in less than eighteen hours and that we won’t see each other again until fall semester, but it will be nice to have light after 10pm and more variety in food again. Today was probably my favorite day we’ve had at Las Cuevas. In the morning we sorted through the arthropods that had fallen into our pit traps and analyzed our data. No orthoptera species fell into the traps, which bummed me out a little, but there were plenty of ants and arachnids. In the afternoon, we went to the Las Cuevas cave. The cave is closed this year because a team of archaeologists are here excavating it, so we couldn’t go as far in as they do most years. We could still go in the entrance and pass through to the second chamber. The constriction built by the Mayans dividing the first and second chambers. This cave was used by the Mayans for religious ceremonies, so there are still platforms in the cave they built, as well as constrictions between each chamber. Once we went into the second chamber, we had Ellie and Isaac’s Amphibian and Reptile presentations. It was funny that we heard Isaac’s presentation in the cave because on the way out we saw a snake in the Twilight Zone. It was crazy because it slithered up the wall and disappeared into a crevasse. Also in the cave, I saw a Mayagryllus apterus cave cricket. 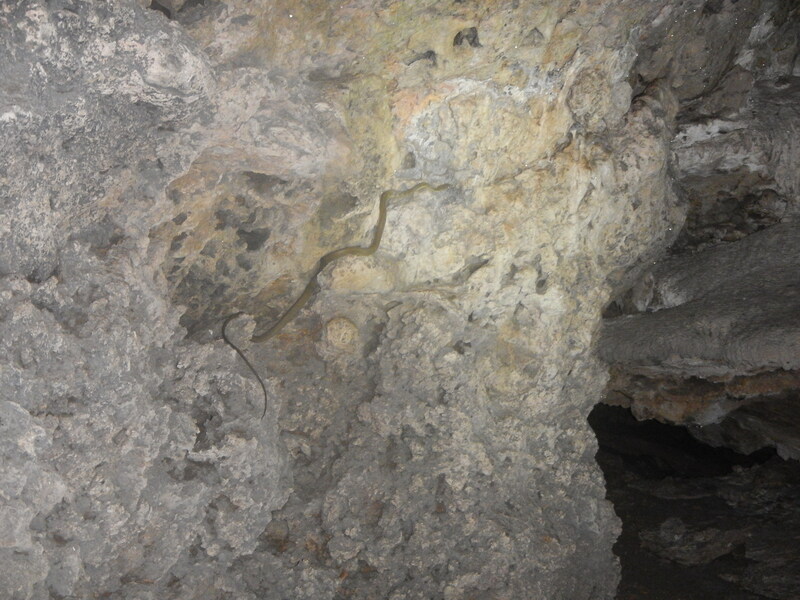 A snake slithering up the wall of the cave. 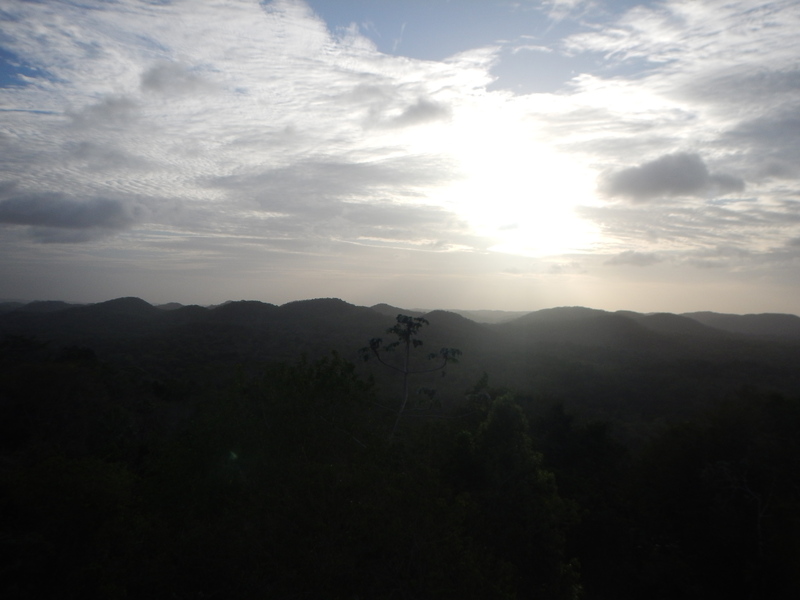 In the evening, we hiked up to the Bird Tower to watch the sunset. The hike there was short but steep, and once we climbed the tower we were way above the canopy. The mountains in the background were all such beautiful shades of greens, blues, yellows, and oranges. The view of the sunset from the observation tower. To add to the day’s theme of unusual lecture locations, we all sat down on top of the tower for Therese to give us a talk about the research she is doing for her PhD about the effects of defaunation, which is the loss of large vertebrates like gorillas and elephants. After we finished the lecture, we climbed down the tower and scaled its sides and hung out for a bit. Then we started back to the station. Since it was dark, a lot of cool animals were out. 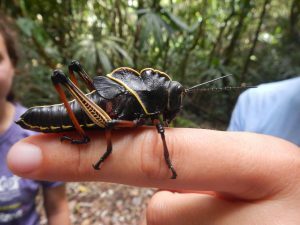 We saw a mouse, scorpions, a Tailless Whip Scorpion, a huge cockroach, and a lot of Orthoptera. It’s crazy how much the community of a place changes from day to night. Today we experienced Scott F. Solomon in his true element: digging up leaf-cutter ant colonies. We went to three different-aged colonies to dig in to and see their tunnels and fungal gardens. With his tiny shovel and stolen spoon, Dr. Solomon pulled out two of the three colonies’ fungi. It was cool to see how complex the colonies can be and how their complexity increased with age (a single queen can keep her colony growing for 25 years! ), but being that close to so many ants was a bit unpleasant. The other main thing we did today was set up an experiment to test abundances of arthropods and nutrient availability on the forest floor versus in the canopy. This involved each of us filling two viles with our pee and two with water and then tying half to trees and burying half in the ground. Tomorrow we are going to examine the arthropods that fell into the viles. The day after tomorrow is when we are going to have to go and retrieve our camera traps. I’m excited to see the pictures they’ve taken, but I’m not looking forward to the hiking it will involve. Although the hiking yesterday felt fine, the minimal hiking we did today was pretty painful and quite laborious because I cut my foot on a conch at Glover’s a little over a week ago. As a reminder of our time on Middle Caye, four pieces of shell came out of the cut today. I’m hoping that was the last of it (spoiler: it wasn’t) and that it won’t be as painful in the coming days. We spent not much time in the woods today, so I did not see any Orthoptera. However, I’m hoping we’ll find lots in the viles. 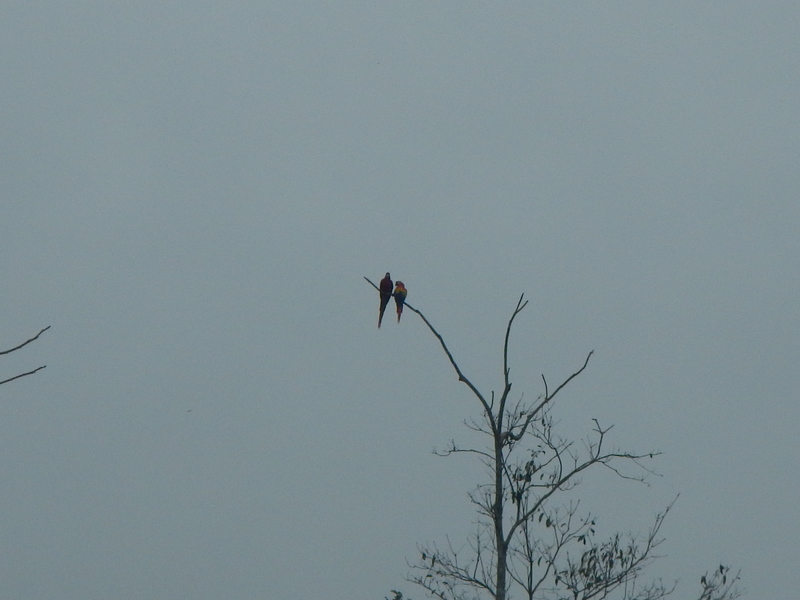 The highlight of today was the Scarlet Macaws we saw. Two of them flew over us and then stopped in a tree nearby. It was a hard to get a picture that did them or their colorful plumage justice, but I don’t think it’s something I will ever forget. 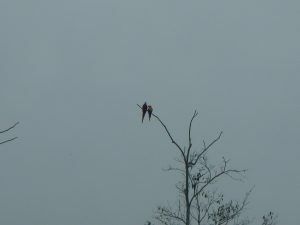 Two Scarlet Macaws spotted in the Chiquibul. Today was the second to last travel day of our trip. We reached Las Cuevas and will stay here until the 30th when we’ll head back to the airport in Belize City. The drive was mostly through the Pine Ridge Forest and the Chiquibul Rainforest. To break it up, we stopped in the Rio-On pools midmorning. 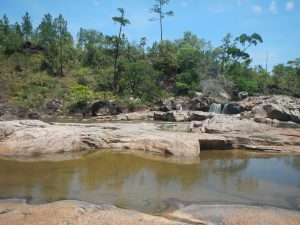 This was for us to get an idea of the karstist geological features of Belize and to swim and enjoy ourselves. 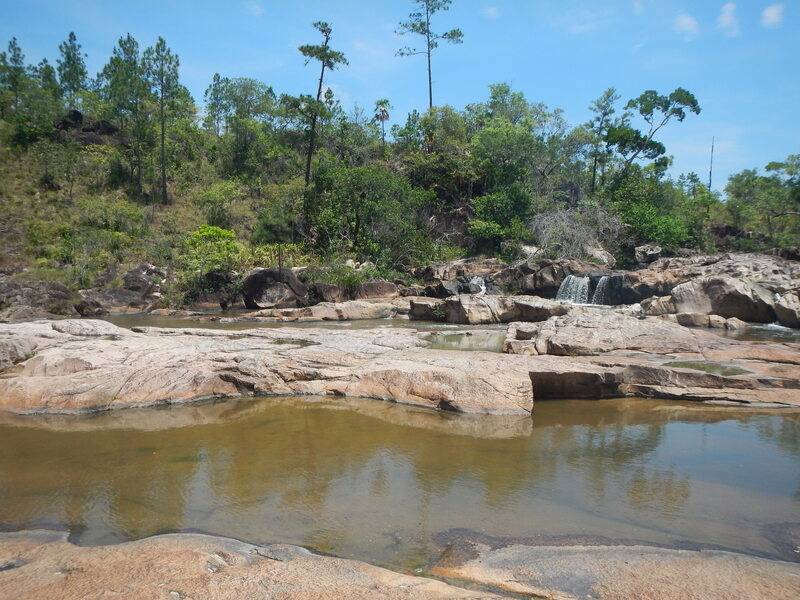 At Rio-On, there were a lot of granite rocks with small pools and waterfalls between them. It was fun to scramble around on the rocks and try and slide down the waterfalls. We stayed there about twice as long as we were supposed to, but nobody seemed to mind. Rio-On Springs. It was really fun to swim and climb around here. 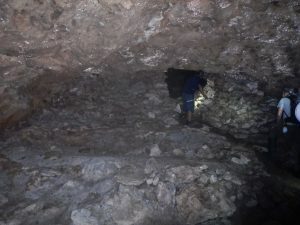 When we got to Las Cuevas, we learned that the cave here is closed. The worst part of this is that we all brought caving helmets and we aren’t going to ever use them. At least we got to see the ATM cave already. We also learned that there isn’t Internet here, which is why all these posts are going to go up at once. Shortly after arriving, we went on a short hike on a trail near the station. We saw ceiba, cedar, acacia, sapodilla, Gumbo-limbo, and prickly yellow trees. We also saw fish tail palms, a plant that is often illegally extracted by Guatemelons for the floral business. 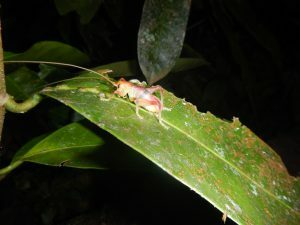 I saw two species of Orthoptera, which surprised me. 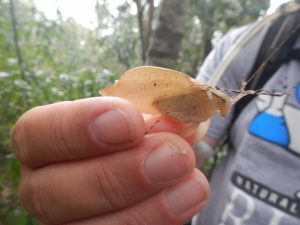 One I think was a species of Leaf-mimic katydid (Mimica spp.) The other one I couldn’t confidently identify yet but it might have been Amblytropidia trinitatis. Tomorrow we are forming a question that we are going to answer with camera traps, and we’re going to spend most of the day setting them up throughout the forest. I think it is going to involve a lot of walking, which I am not looking forward to because my foot still hurts from when I stepped on a conch. Today was an incredibly full day. 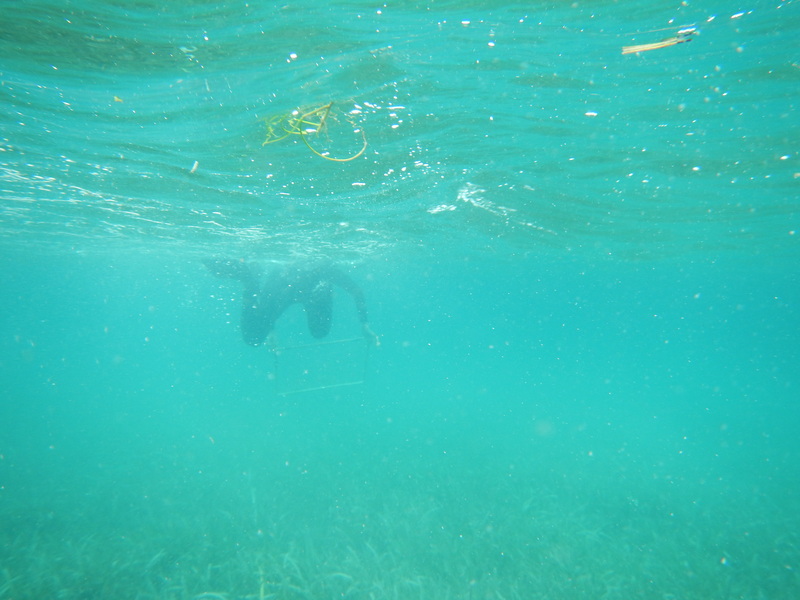 We put the quadrats we made last night to good use by first estimating crab density on the island, then taxons represented within the seagrass beds, and then finally advancing to quantifying reef health on a patch reef within the conservation zone. Tomorrow we are going to repeat the procedures for quantifying reef health within the general use zone to see if there are observable differences between the two zones. Therese swimming along our transect. Another way we are going to compare the two zones is by urchin size. Today on the patch within the MPA, 16 of us collected as many urchins as we could for 25 minutes. I saw Diadema urchins but I did not collect any because their spines are the longest and they seemed to be hidden deeper than the other two species. I only found one Slate Pencil Urchin but lots of Reef Urchins. A Slate Pencil Urchin collected within the Marine Protected Area. Today I encountered two weird issues. 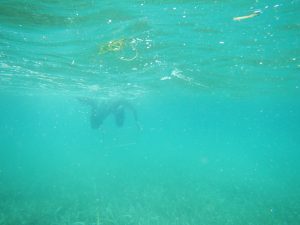 First we drifted away from our quadrat within the seagrass, and it took about 20 minutes of frantic searching before we found it again. 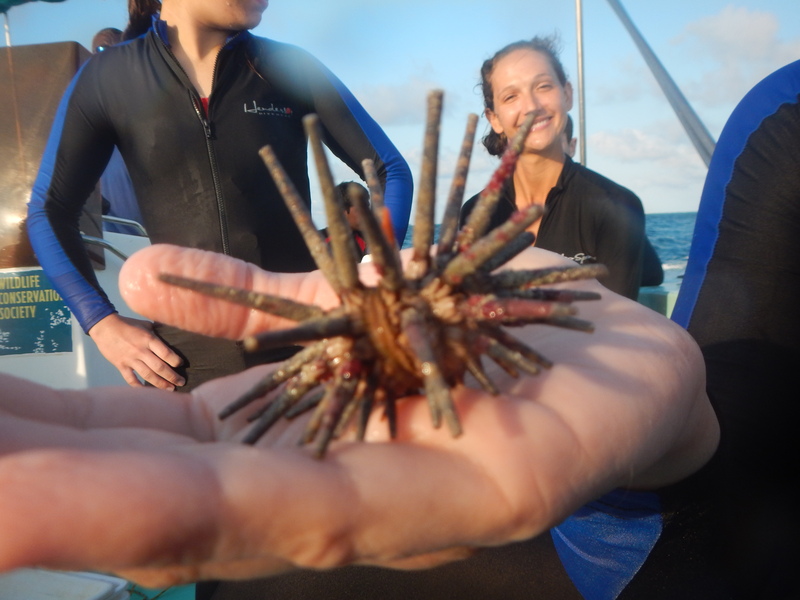 The other issue happened during the urchin hunting because somehow I got four urchins stuck in my hair really badly. For a good while I thought we were going to have to cut them out but eventually they let go. Adrienne pulling the urchins out of my hair. Since we were doing the work with the quadrats today, I had less time to find green algae. I did see more Acetabularia calyculus and Rhipocephalus phoenix again. I also saw what I think was Caulerpa cepressoidea and maybe some Chaetomorpha. Today we went to Actun Tunichil Muknal archeological reserve. Here we hiked into a cave that was used for Mayan sacrifices and has lots of well-preserved artifacts and human remains. I did not see any Orthoptera. We weren’t allowed to take pictures inside of the cave, but here’s a picture of the sign! To get to where the artifacts and remains were, we had to swim and scramble our way through the cave. The guide said I had to wear the top I had been carrying out of respect to the ancient Mayans, so it was real frigid being in the cave because the rivers were so cold and my clothes were so wet. Nevertheless, it was crazy to be inside of such a sacred place, especially since we could see the vessels and victims of sacrifices all around us and knew that only the most elite Mayans would ever enter the cave. As neat and memorable as it was, I kind of felt like it was inappropriate for us tourists to be climbing around in there, given the religious significance the cave has. Maneuvering through the cave was pretty complicated because it involved a lot of climbing up tall structures and fitting our heads through small cracks. At some point when we were climbing, Deepu scraped his leg and bled some. When we were in the cave, our guide taught us about bloodletting, a process in which people would slit themselves with obsidian blades or stingray barbs and offer their own blood to the Gods, so we were joking about how Deepu was partaking in bloodletting. It was really eerie when we emerged from the cave to see that it had just started to pour as if Deepu’s sacrifice to Chaac, the rain God, had worked. After we left the cave, we drove to Crystal Paradise Resort where we are spending tonight before going on to Las Cuevas. On the way we stopped in the town of San Ignacio. There I bought a bag of grapes and tried a baby banana. Also, I made Therese go ask a man with a produce stand if we could have some of the oranges that had fallen out of his truck. I think he took pity on us because he just gave her two fresh ones. These are some of the advantages of having a TA. 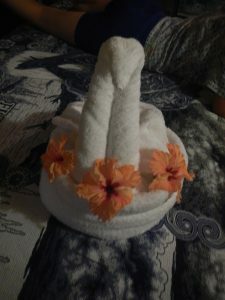 The towel swan at Crystal Paradise: They really treated us well! Today was another travelling day. We left Glover’s in the morning to head back to the mainland. We did one last snorkel on the way back through the mangroves at Twin Caye. There, we saw a manatee, a yellow seahorse, a magnificent feather duster worm, and a lot of upside down jellyfish. I also saw some Caulerpa algae, and many of the algae species I’d seen around the patch reefs. 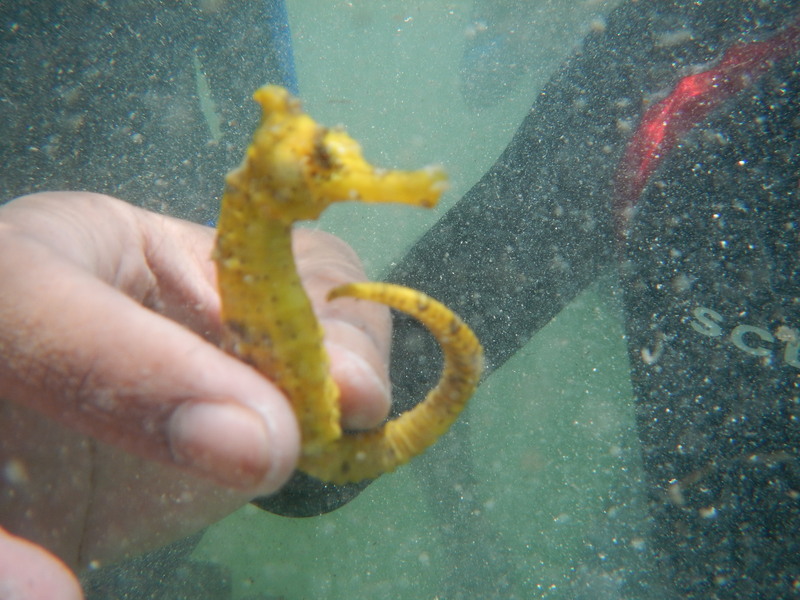 A seahorse found in the mangroves. His coloration makes him look a lot like a dead mangrove leaf! The other place we stopped on the way back was Carrie Bow Caye, the Smithsonian Research Center. It was cool to meet the volunteer station manager, Clive, and hear about the research going on there. 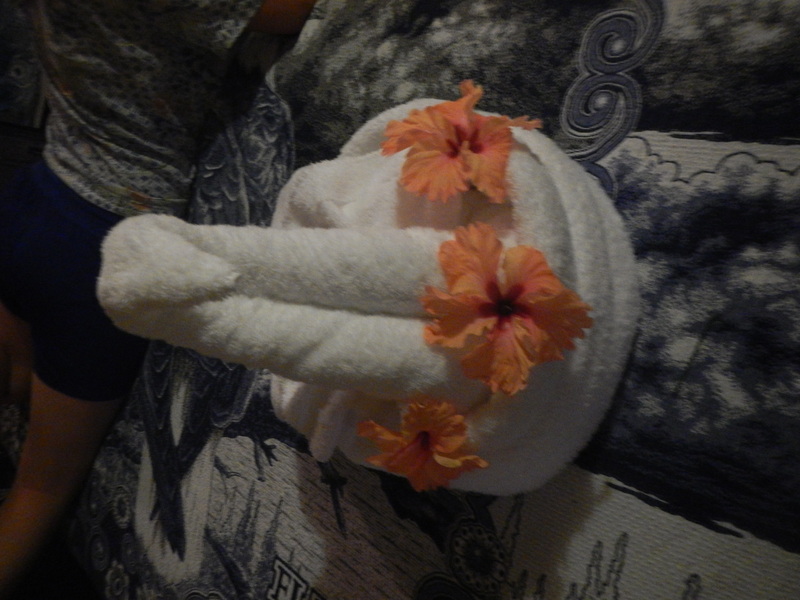 Once we got back to the mainland, we went back to the Tropical Education Center where we are staying again tonight. We spent the evening at the Belize Zoo and got an amazing tour. We saw five big cats, including a jaguar that did somersaults for us. We also fed a tapir and two crocodiles. 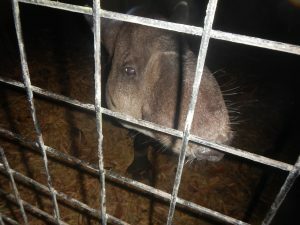 The Tapir we fed at the zoo. The last thing we did tonight was talk with Lucrecia, who is in Belize to do cat research and took EBIO 319 last year. It was good to see her because we ran cross country together in the fall but she spent the spring semester in Tanzania, and it sounds like she has been doing some really cool stuff. Tomorrow we are going to a cave. I’m sure it is going to be awesome, but I’m still a little sad that we aren’t at the reef anymore.